Fierce fighting continued on both sides of the Lebanese-Israeli border Thursday, and, with the death toll mounting, a top Israeli official said the strikes on southern Lebanon will not end soon. Israel's army chief said the offensive in Lebanon will not end until Israel's security is restored, and he vowed to destroy Hezbollah's arsenal and military capabilities. How much of the guerilla group's arsenal remains is in question. It is believed that Hezbollah had about 13,000 Katyusha-type rockets at the beginning of this round of conflict. Shaul Mofaz, a former Israeli defense minister, said on Israel's Army Radio that about 50 percent of Hezbollah's arsenal of weapons and buildings has been destroyed by the Israeli offensive. Israeli Brig. Gen. Alon Friedman gave the same estimate on Wednesday. But, CBS News National Security Correspondent David Martin reports that U.S. intelligence estimates that only a third of the weapons have been fired or destroyed by Israeli bombardments. Appearing on Al-Jazeera on Thursday afternoon, Hezbollah leader Sheik Hassan Nasrallah denied Israeli claims that 50 precent of his guerrillas' rocket arsenal has been destroyed. "Hezbollah has so far stood fast, absorbed the strike and has retaken the initiative and made the surprises that it had promised, and there are more surprises," he said, warning that a Hezbollah defeat would be "a defeat for the entire Islamic nation." Israeli Brig. Gen. Ido Nehushtan said that Hezbollah has fired more than 1,100 rockets at civilian areas in Israel since the fighting began and that 12 percent - or about 750,000 people - of Israel's population lives in areas that can be targeted by the guerrillas. "The fighting in the north ... could last much longer," Lt. Gen. Dan Halutz, the army's chief of staff, said in a letter to soldiers and officers. "We are being tested at this time. Our moral strength and value will reflect on the state of Israel and its residents, and on their ability to continue to stand up to the threat on the front." "We will operate for as long as necessary until security is returned to the state of Israel," he added. At least 306 people have been killed in Lebanon since Israel's campaign began, according to Lebanese officials. At least 29 Israelis have been killed, including 14 soldiers. 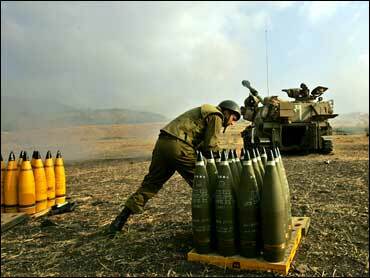 Hezbollah guerrillas fired 25 rockets into Israel on Thursday. The attacks caused no casualties. The Israeli military said aircraft dropped 23 tons of explosives on what it believed was a bunker for senior Hezbollah leaders in Beirut between Wednesday night. Hezbollah leader Sheik Hassan Nasrallah said in an interview on Al-Jazeera, "I can confirm without exaggerating or using psychological warfare, that we have not been harmed." Hezbollah claims the building destroyed was a mosque under construction, not a command center. Nasrallah said there was "no way in the world" he would surrender two Israeli soldiers snatched by his guerrillas on July 12 except as part of a prisoner exchange brokered through indirect negotiations. The first evacuees from battle-scarred Lebanon arrived in the United States on Thursday, tired but relieved to be far away from window-shattering bombs and fiery explosions. About 150 people were aboard the DC-10, which landed at Baltimore-Washington Thurgood Marshall International Airport outside Washington. The passengers traveled from Cyprus to Manchester, England, and then to Baltimore in about 12 hours as part of a massive evacuation effort. Israel's army dropped leaflets Thursday warning residents of attacks on homes believed to be hiding militant weapons as air and ground forces raided a Gaza refugee camp for a second day, killing three Palestinians. U.N. Secretary-General Kofi Annan called for an immediate halt in the escalating crisis in the Middle East. He criticized Israel for "excessive use of force" and said Hezbollah guerrillas "hold an entire nation hostage." Secretary of State Condoleezza Rice "does intend to travel to the region, and she intends to travel to the region as early as next week," said State Department spokesman Sean McCormack Thursday. The House, displaying a foreign affairs solidarity lacking on issues like Iraq, voted overwhelmingly Thursday to support Israel in its confrontation with Hezbollah guerrillas. The resolution, which was passed on a 410-8 vote, also condemns enemies of the Jewish state. Israeli troops met fierce resistance from Hezbollah guerrillas Thursday as they crossed into Lebanon to seek tunnels and weapons for a second straight day, and Israel hinted at a full-scale invasion. Israel warned residents to "immediately" flee a nearly 20-mile swath of south Lebanon along the border. Its warplanes also launched new airstrikes on Beirut's southern suburbs, a Hezbollah stronghold, shortly after daybreak, followed by strikes in the guerrillas' heartland in the south and eastern Bekaa Valley. The planes also bombed large parts of the south, from which Hezbollah guerrillas fired more rockets into Israel. On Wednesday, Israeli bombings killed as many as 70 people, according to Lebanese television, making it the deadliest day since the fighting began July 12. A large fight between Israeli forces and Hezbollah guerrillas broke out Thursday evening on the Lebanese side of the border, the Israeli army said, adding that its troops suffered casualties but did not elaborate. Hezbollah's Al-Manar television said three Israeli soldiers were killed and 10 wounded in fighting. The forces crossed the border as part of ongoing operations to push back Hezbollah guerrillas who have continued firing rockets into northern Israel despite more than a week of massive bombardment. Israel has mainly limited itself to attacks in Lebanon from the air and sea, reluctant to send in ground troops on terrain dominated by Hezbollah. But an Israeli army spokesman refused to rule out the possibility of a full-scale invasion. Israel broadcast warnings Wednesday into south Lebanon, telling civilians south of the Litani River to "leave their areas immediately for their own safety" — a possible prelude to a larger ground operation. "There is a possibility — all our options are open. At the moment, it's a very limited, specific incursion but all options remain open," Capt. Jacob Dallal, an Israeli army spokesman, told The Associated Press on Wednesday. U.S. intelligence sources don't believe the Israelis will launch a full-scale invasion, Martin reports.